This post is about my first experience making beaded jewelry. It's one of those moments where I am not even going to pretend to be somewhat of an expert in the area of beading or jewelry making. In fact, the opposite - barely a novice! But I do want to share with you my experience of learning this craft for the first time, and any any tips or advice I would offer anyone else who is interested in this fun activity. My friend Bonni is an incredible crafter, talented in more ways that I can count. One of her most refined skills is in bead work and jewelry making. So much so, that she owns her own business called Bead on a Wire. I recently was re-elected to the Toronto Home Economics Association board of directors, and was asked for ideas from the program committee for upcoming networking and professional development opportunities. 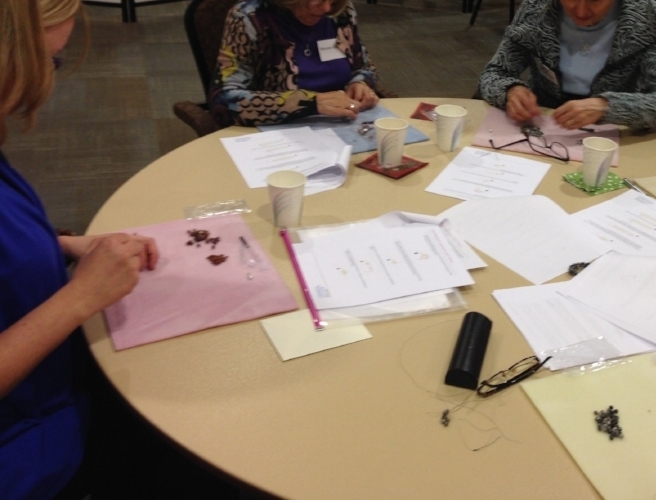 I immediately suggested a jewelry making workshop with Bonni that would allow members to learn something new, while also having some fun and an opportunity to network with one another. A group of THEA members gathered for the workshop at the beautiful Kintore College on the University of Toronto campus one November evening for the workshop. Bonni introduced us to our basic supplies for the evening, as well as the right angle weave, which is a foundational technique for beading (which is essentially a process of looping four beads into a diamond shape). There was a wide assortment of coloured "bead kits" we could select from, and a few of the colour combinations were limited in number. This caused some excitement from a couple of the members about ensuring they secured the bead kit of their preference when Bonni invited everyone up to pick up their kit to get started. Bonni provided each participant with a felt mat that would ensure the beads and materials would stay secure as we were working on them. She also provided directions on how to craft the bracelet as well. If you are curious to see the steps we followed for this craft, there is a wonderful Toronto blog called The Blue Brick where step by step directions are posted for making a similar bracelet to what we crafted at the workshop. 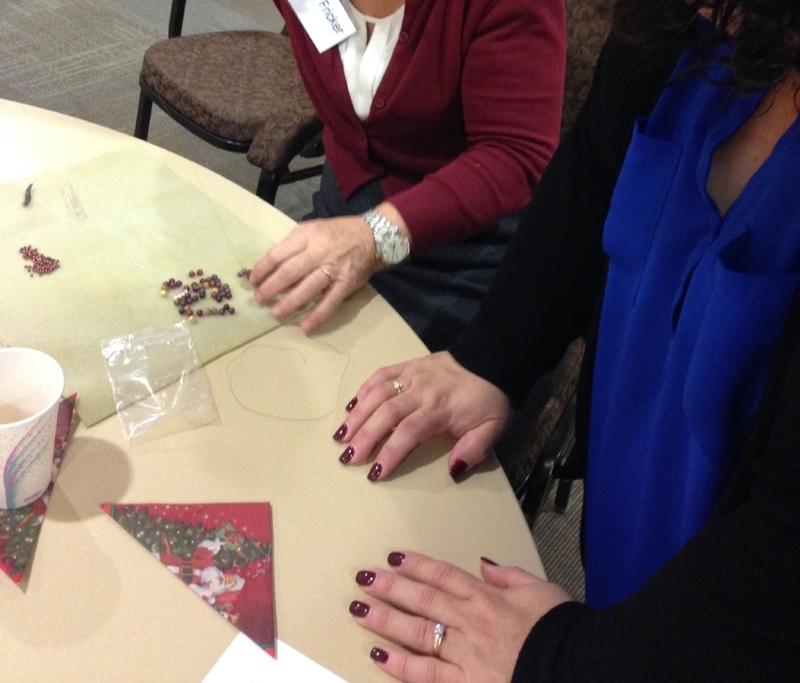 At the end of workshop, Bonni also provided participants with the opportunity to purchase an extra "bead kit" for $5 that they could take with them to complete an additional bracelet for themselves, or for a holiday gift for someone else. Plenty of members took her up on this generous offer, which speaks volumes to how much fun this event was. If you are able to, go to at least a class or a few to become oriented in beaded jewelry making & its techniques. Above you are provided with a link to a beautiful resource clearly outlining all of the steps to making a beaded bracelet using the right angle weave, but Bonni was able to guide us through the project with quick and easy tips on how to monitor and adjust our tension, how to get back on track if we tangled things up or made a mistake, or simply reassure us when we thought we'd gone really far off track (which often happened in the confusion of staring too hard at a lot of little tiny beads and an itty bitty wire and needle). Ask your teacher lots of questions! Bonni was a wealth of information for us on where she got all of her quality supplies, and I learned that my beads actually came from Australia! She also showed us lots of tricks on how to ensure things wouldn't unravel and how to hide the loose ends of the wire like a pro. She also gave us information on things like the wire we needed for jewelry making, the needles we should use, and the use of felt mats were also key to beading success & sanity! Printed step-by-step instructions do not always work to expertly guide you for every new craft project. I would estimate that most of the participants, myself included, at this workshop needed to call on Bonni at least once or twice to ensure we could get assistance. And this was after we had read over her excellent and detailed step by step directions in front of us! Don't feel bad - it's a new skill you are learning, after all! If you have a crafty friend or colleague, try this activity together. It helped knowing that you weren't in it alone, and it provided for some good laughs. And the worse case scenario was that there was chocolate on the refreshments table. In this situation, the THEA event was an excellent icebreaker to really get to know people, and I was happy to make a couple of new acquaintances as a result. Give yourself lots of time. We discovered that 2 hours was, in the end, perhaps a bit ambitious to complete this task. However, most of us did finish the project in it's entirety, and the final products were beautiful! If you happen to be in the Greater Toronto Area and are wondering where you might find such workshops, you can check for classes at your local community centres or craft stores. Fortunately, Bonni also teaches in Toronto at BeadFX and she has a class coming up on January 14th, 2016. If anyone wishes to reach her to organize a private event or class, they can do so by visiting www.beadonawire.ca. Have you tried any new crafts lately? Do you have any DIY crafts on the horizon for 2017?